Popular 1/4 HP with removable tether float switch to use as utility pump. 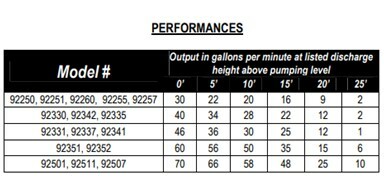 Learn More about the Superior Pump 92250 Sump Pump with its features, specifications, reviews, manuals, and parts. Shop Best Seller 92250 discount price. 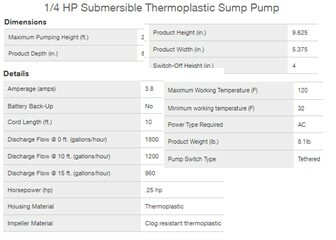 DESCRIPTION: The Superior Pump 92250 is known for its thermoplastic motor housing construction and quick float disconnect to use a utility pump. It is a best seller submersible sump pump among those with the following features: 1/4 HP, Thermoplastic Housing and Base, Tether Float Switch, 1200 GPH and 20 GPM @ 10 Foot Vertical Height, 1 Year Warranty, 10 Ft. Power Cord with 1 1/4-in or 1 1/2-inch Discharge Port. Only Three Parts Are Available – 92000 (Tether Float Kit) and 92060 (Vertical Float Kit) and 92010 (Tether Float With Alarm). 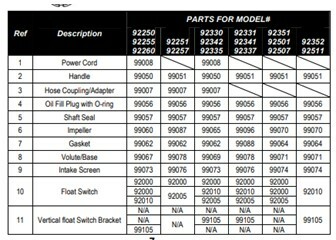 Addtional Parts can be purchased from Superior Pump. – ✓ More Height: 10.75-in. – ✓ Lower ON OFF Points: ON is 5-In. OFF is 2.5-In. – ✓ More Weight: 16.95 lbs. – ✓ More Height: 11.5-In. – ✓ More Width: 7.75-In. – ✓ Longer Warranty: 3 yr.
– ✓ Lower ON OFF Points: ON is 8.5-In. OFF is 3-In. – ✓ More Weight: 22-lbs. – ✓ More Height: 14-In. – ✓ More Width: 6.5-In.